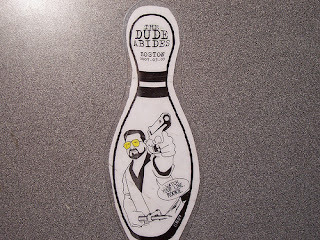 It started at King's Bowling alley which is perfect because the theme was the Big Lebowski...the "Dude Abides" race. You had to complete 5 missions, or so I heard. I just sort of followed people around with the helmet cam and then ended up drinking at a checkpoint where they dowsed people in flour. Yes, I'm getting old and tired. 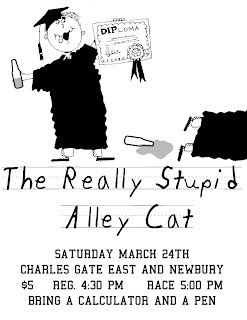 But Boston has a great scene and people came out from NY, DC, Philly and represented. Then we ened up at a V.F.W. in South Boston and listened to a great band, "CocktoPuss" and raced gold sprints. Here are some pictures of the start of the race. Our own NACCC won, best out of towner...go Austin. Thanks to Jacob and all those who put on a great time in Beantown. bikesnotscott has some pictures up on flickr. Whats wrong with our city council? 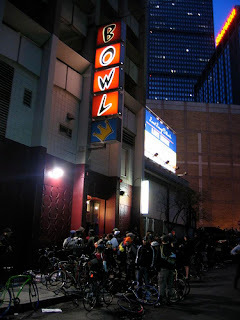 Critical Mass report and pictures.